Part 1: What do the standards say? Part 2: How do the congruence standards relate to other parts of geometry? Part 3: Where do the congruence standards come from? G-CO.A | Experiment with transformations in the plane. G-CO.B | Understand congruence in terms of rigid motions. G-CO.C | Prove geometric theorems. G-CO.D | Make geometric constructions. Welcome to the UnboundEd Mathematics Guide series! These guides are designed to explain what new, high standards for mathematics say about what students should learn in each grade, and what they mean for curriculum and instruction. This guide, the first for High School Geometry, includes two parts. The first part gives a “tour” of the standards involving congruence using freely available online resources that you can use or adapt for your class. The second part shows how congruence relates to other concepts in geometry. And the third part explains how congruence relates to what students learn in Grades K-8. Another reason to start with congruence is that two of the four clusters covered in this guide (G-CO.B and G-CO.C) are also recognized as part of the “major work” of geometry by the PARCC Model Content Frameworks, meaning they deserve a significant amount of attention over the course of the school year.1 Though many people know PARCC as an organization dedicated to assessment, much of its early work focused on helping educators interpret and implement the standards. Its Model Content Frameworks are a result of those efforts: They describe the mathematics that students learn at each grade level and in each high school course, and the relative amount of time and attention that standards should be given in a grade or course. Many teachers, regardless of their state’s affiliation with PARCC, have found these documents helpful. You can find them here. In this guide, major clusters and standards are denoted by a green square (e.g. G-CO.B.6). Though many people know PARCC as an organization dedicated to assessment, much of its early work focused on helping educators interpret and implement the standards. Its Model Content Frameworks are a result of those efforts: They describe the mathematics that students learn at each grade level and in each high school course, and the relative amount of time and attention that standards should be given in a grade or course. Many teachers, regardless of their state’s affiliation with PARCC, have found these documents helpful. You can find them here. In this guide, major clusters and standards are denoted by a green square (e.g. G-CO.B.6). Though many people know PARCC as an organization dedicated to assessment, much of its early work focused on helping educators interpret and implement the standards. Its Model Content Frameworks are a result of those efforts: They describe the mathematics that students learn at each grade level and in each high school course, and the relative amount of time and attention that standards should be given in a grade or course. Many teachers, regardless of their state’s affiliation with PARCC, have found these documents helpful. You can find them here. In this guide, major clusters and standards are denoted by a green square (e.g. G-CO.B.6). Prioritizing major work within the year ensures that those standards are sure to get the attention they deserve. And the other two clusters (G-CO.A and G-CO.D) are designated as “supporting” clusters, meaning that learning around these standards supports the major work of the course. The high school standards are organized into five “categories,” and within each category are a number of “domains.” Congruence is one domain in the domain in the geometry category, and is divided into four clusters: each focuses on a different approach to understanding congruence and working with geometric figures. Before we get started with the content in these standards, let’s pause and take a look at the standards themselves. Construct an equilateral triangle, a square and a regular hexagon inscribed in a circle. Before we begin working our way through these standards, let’s pause for a moment and consider why transformations are so important. In the past, geometry in Grades K-8 tended to focus on a broad range of topics, none of them taught very deeply. Meanwhile, high school geometry tended to focus on formal proof with a heavy emphasis on triangle congruence theorems, which didn’t relate well to anything students had done before. Transformations weren’t emphasized much (if at all) and didn’t relate to other ideas in the course. Now, however, transformations are used to develop many of the central concepts in geometry, including congruence and similarity. And work with transformations begins in Grade 8, creating an extended “runway” into high school study. Proof should still be an important component of geometry courses, but some of the work that students used to accomplish through months of work with basic proofs can be handled more efficiently and less abstractly by transformations. And transformations will also allow students to establish congruence in a wide variety of cases, rather than being restricted to work with only triangles and parallelograms. Let’s begin with geometric constructions. A lot of us learned these by memorizing a list of steps for each construction: how to bisect an angle, how to copy a segment, etc. However, the Standards offer a huge opportunity to use constructions not as a collection of skills unto themselves, but as a method for helping students understand the properties of essential figures such as triangles, the rigid motions and congruence. By performing constructions, students achieve a more intuitive, “hands-on” understanding of these concepts, and they become aware of important nuances in their definitions. For example, some students might enter high school knowing rough definitions of a reflection, a translation and a rotation, but performing each of these transformations with construction tools can help them formulate precise definitions of these ideas. In a similar way, constructing transformed figures can help them understand why congruence can be framed in terms of rigid motions. Later, students can also construct figures in the context of proofs (for example, when it might be necessary to construct an auxiliary line). Most students will need explicit instruction on how to use a compass and a straightedge, and initial work with constructions might focus on mastering use of the tools and performing basic tasks (such as copying a segment or bisecting an angle). (G-CO.D.12) From there, they might focus on other, more involved tasks (such as constructing a square or hexagon). (G-CO.D.13) The problem below shows students how a compass can perform with precision many of the same tasks that in past grades might have required a ruler and protractor. Margie has three cats. She has heard that cats in a room position themselves at equal distances from one another and wants to test that theory. Margie notices that Simon, her tabby cat, is in the center of her bed (at S), while JoJo, her Siamese, is lying on her desk chair (at J). If the theory is true, where will she find Mack, her calico cat? 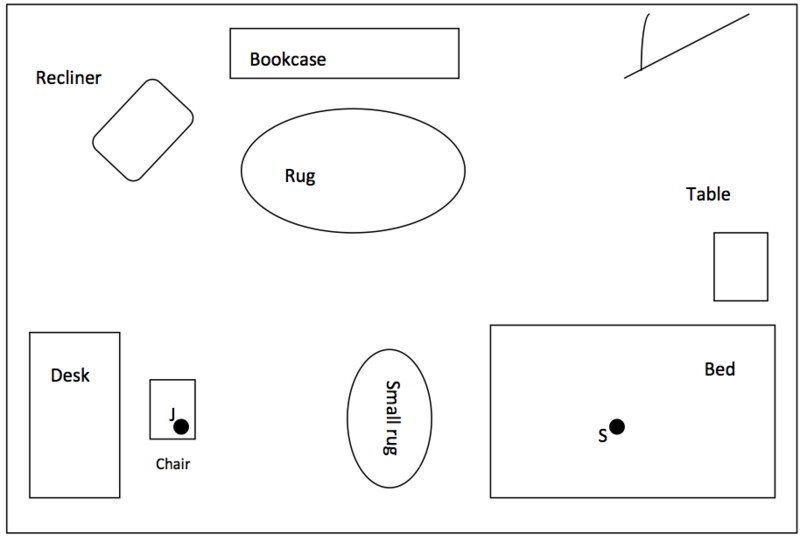 Use the scale drawing of Margie’s room shown below, together with (only) a compass and straightedge. Place an M where Mack will be if the theory is true. Geometry, Module 1, Lesson 1 Available from engageny.org/resource/geometry-module-1-topic-lesson-1; accessed 2015-05-29. Copyright © 2015 Great Minds. UnboundEd is not affiliated with the copyright holder of this work. After students construct an equilateral triangle (thereby locating the third cat), you might push them to explain why this construction works. How did the compass help you create segments of equal length? Was measuring with a ruler necessary to solve this problem? Since you’re using the compass to draw a circle (or part of one), what would you call the segment that runs from the center of each circle to the edge? Could you use a similar technique to copy a line segment, or to create a pair of perpendicular lines? Through their answers to these questions, students should see how they might accomplish similar construction tasks, and can draw connections between a figure they’ve constructed and the underlying properties of that figure. Transformations are first introduced in Grade 8, where they’re part of the major work of the grade. Though it can be tough to know exactly what students will bring with them from the middle grades, many high school teachers might reasonably expect that their students will at least have been exposed to transformations before (because of their emphasis in Grade 8) and will be able to perform and give informal definitions of each rigid motion. The high school standards therefore focus on deepening and formalizing the intuitive ideas students already have about transformations, and then using transformations to develop and apply the concept of congruence. Let’s begin by defining the basic transformations (reflections, translations and rotations) that students will need to begin the year.3 These definitions, taken from EngageNY Geometry (module 1, lessons 13, 14, and 16), may seem very formal at first, but they illustrate the level of precision required for high school work with transformations and congruence. You can feel free to use these definitions with students (after an appropriate introduction, of course). However, these aren’t the only mathematically sound definitions out there; students might well learn others, as long as they’re later able to use those definitions to develop congruence criteria and prove congruence theorems. For a much more extensive treatment of the definitions and properties of each transformation, see pages 65-76 and 127-133 of Hung-Hsi Wu’s Teaching Geometry According to the Common Core Standards. These definitions, taken from EngageNY Geometry (module 1, lessons 13, 14, and 16), may seem very formal at first, but they illustrate the level of precision required for high school work with transformations and congruence. You can feel free to use these definitions with students (after an appropriate introduction, of course). However, these aren’t the only mathematically sound definitions out there; students might well learn others, as long as they’re later able to use those definitions to develop congruence criteria and prove congruence theorems. For a much more extensive treatment of the definitions and properties of each transformation, see pages 65-76 and 127-133 of Hung-Hsi Wu’s Teaching Geometry According to the Common Core Standards. These definitions, taken from EngageNY Geometry (module 1, lessons 13, 14, and 16), may seem very formal at first, but they illustrate the level of precision required for high school work with transformations and congruence. You can feel free to use these definitions with students (after an appropriate introduction, of course). However, these aren’t the only mathematically sound definitions out there; students might well learn others, as long as they’re later able to use those definitions to develop congruence criteria and prove congruence theorems. For a much more extensive treatment of the definitions and properties of each transformation, see pages 65-76 and 127-133 of Hung-Hsi Wu’s Teaching Geometry According to the Common Core Standards. Together, reflections, translations and rotations are known as the basic rigid motions because of the way they move a figure “rigidly” around the plane. Lengths of segments and angle measures don’t change after any of these transformations, resulting in figures that are congruent (and similar) to their originals. For a line l in the plane, a reflection across l is the transformation rl of the plane as follows: (1) For any point P on the line l, rl(P) = P; and (2) For any point P not on l, rl(P) is the point Q so that l is the perpendicular bisector of the segment PQ. 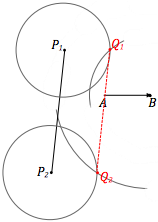 For vector AB, the translation along AB is the transformation TAB(P) defined as follows: (1) For any point P on the line AB, TAB(P) is the point Q on AB so that vector PQ has the same length and the same direction as vector AB; and (2) For any point P not on line AB, TAB(P) is the point Q obtained as follows. Let l be the line passing through P and parallel to the line AB. Let m be the line passing through B and parallel to line AP. 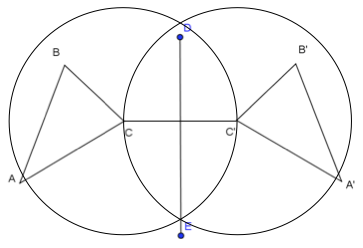 The point Q is the intersection of l and m.
For 0° < 𝛳° < 180°, a rotation of 𝛳 degrees around the center C is the transformation RC,𝛳 of the plane as follows: (1) For the center point C, RC,𝛳(C) = C; and (2) For any other point P, RC,𝛳(P) is the point Q that lies in the counterclockwise half-plane of CP such that CQ = CP and m∠PCQ = 𝛳°. To get started with the rigid motions, it’s helpful for students to define a few basic concepts that they’ll be using all year long. (G-CO.A.1) Examining the elements of geometry gives students an idea of what the work of the course is really about, and having a common vocabulary allows everyone in the class to communicate clearly with one another. As with all concepts in geometry, students start with a few basic assumptions about points, lines and distances, and use these to develop more complicated ideas. A circle, for example, is the set of points the same fixed distance from a given center point. Though it’s important for students to learn precise definitions, they should do so in memorable ways—by formulating and refining their own definitions, discussing possible definitions with peers and even constructing the objects they’re defining. This task below shows one possible way that students might develop a sufficiently precise definition of parallel lines. Analyze each definition, indicating if it is mathematically correct and if it has any drawbacks. “Defining Parallel Lines” by Illustrative Mathematics is licensed under CC BY 4.0. It must be clearly and precisely stated with no ambiguity. It must capture all possible situations or scenarios. With practice, students should be able to apply these criteria to other definitions during the course of the year, as well as to arguments in formal proofs. Two of these points represent distinct advances over work in Grade 8. First, the degree of precision with which students need to define each transformation is greater, requiring use of the concepts students explored earlier to formulate these definitions. As an example, take the definition of a reflection above, which relies on lines, segments and perpendicular bisectors. For a line l in the plane, a reflection across l is the transformation rl of the plane defined as follows: (1) For any point P on the line l, rl(P) = P, and (2) For any point P not on l, rl(P) is the point Q so that l is the perpendicular bisector of the segment PQ. Second, students should begin to see transformations as functions that transform the entire plane—the inputs and outputs of which are points—rather than as physical movements of figures within the plane. Consequently, transformations can be described with function notation (as in our definition above) and manipulated in ways similar to algebraic functions. It’s important to realize that not all of these concepts and skills need to (or should be) taught in isolation. For example, a single lesson might focus on both performing reflections and developing the precise definition of a reflection (which might also include the notion of a reflection as a function). Subsequent lessons could focus on translations and rotations in a similar way. The task below comes from one such lesson. Think back to Lesson 12 where you were asked to describe to your partner how to reflect a figure across a line. The greatest challenge in providing the description was using the precise vocabulary necessary for accurate results. Let’s explore the language that yields the results we are looking for. What do you notice about these perpendicular bisectors? Geometry, Module 1, Lesson 14 Available from engageny.org/resource/geometry-module-1-topic-c-lesson-14; accessed 2015-05-29. Copyright © 2015 Great Minds. UnboundEd is not affiliated with the copyright holder of this work. This section of the lesson is remarkable for a couple of reasons. First, it uses constructions to emphasize each aspect of the reflection. In constructing the perpendicular bisector between each pair of corresponding points, students are able to identify the line of reflection and more clearly articulate a definition using that term. In order to help students develop a complete definition, you might ask a few follow-up questions. Imagine that △ABC moved closer to the line of reflection; what would happen to segments AO and A’O? If △ABC moved so that point C was on the line of reflection, where would C’ be? Once students realize that points on the line of reflection map to themselves, have them account for this in their definitions. After they’ve developed some working definitions, you can help them formalize their ideas and language to achieve a sufficiently precise result. During the process of definition-writing, you might have to explicitly introduce the idea of a reflection as a function, and the conventions of function notation. You might frame a reflection as a “rule that assigns each point to another,” or say that a reflection “inputs a point and outputs another point.” It may then be worth asking: Do students know of a concept from prior experience that describes this type of relationship? Standard G-CO.A.2 also says that students should be able to “compare transformations that preserve distance and angle to those that do not (e.g., translation versus horizontal stretch).” This allows students to see that there are other transformations aside from the rigid motions, and thereby prepares them to learn about dilations and similarity later on. This task, which treats the transformations involved as functions, is based on the example given in the standard. Does preserve distances and angles? Explain. “Horizontal Stretch of the Plane” by Illustrative Mathematics is licensed under CC BY 4.0. Students might get started by performing the transformations f and g; trying this out might be a good way to familiarize them with coordinate notation for transformations. Then, if you wanted to stretch this problem beyond the prompts given, you might ask students to name what the types of transformations given by f and g would be. What actions could we perform on △ABC that would preserve distances and angles? And what predictions can we make, if any, about the types of transformations that will preserve distances and angles, and those that won’t? To round out students’ understanding of transformations, they should see instances of transformations that map figures to themselves. (G-CO.A.3) The purpose of exposing students to these special cases is to help them develop a more complete and transferable understanding of reflections, rotations and symmetry. This task presents a nice example of how thinking about how figures map to themselves can yield a deeper understanding of the properties of transformations. Find all rotations and reflections that carry rectangle onto itself. Lisa draws a different rectangle and she finds a larger number of symmetries (than Jennifer) for her rectangle. What can you conclude about Lisa's rectangle? Explain. “Symmetries of Rectangles” by Illustrative Mathematics is licensed under CC BY 4.0. While transformations are interesting in themselves, and contain much more nuance and applicability than historically laid out in curricula, the standards are not intended to communicate the study of transformations for transformations’ sake. On the contrary (and in the spirit of coherence), being able to perform, define and articulate the properties of the basic rigid motions allows students to use them to establish the congruence of two figures. That’s the real value of transformations, and it’s the reason students should spend so much time getting to know them up front. Having a variety of ways to show that two figures are congruent allows students to flexibly solve problems involving related figures, as well as a method to prove congruence of various figures (not just triangles). Therefore, as their work with transformations progresses, students should have problems that require them to predict the effect of a given transformation on a figure, as well as to assert the congruence of two figures in terms of rigid motions. (G-CO.B.6) The exercises below, taken from a lesson on describing congruence and using function notation for a sequence of transformations, show how this might look. i. Draw and label a in the space below. ii. Use your construction tools to apply one of each of the rigid motions we have studied to it in a sequence of your choice. is congruent to because rigid motions map point to point point to point and point to point Rigid motions map segments onto segments of equal length and angles onto angles of equal measure . On a separate piece of paper, trace the series of figures in your composition but do NOT include the center of rotation, the line of reflection, or the vector of the applied translation. Geometry, Module 1, Lesson 19 Available from engageny.org/resource/geometry-module-1-topic-c-lesson-19; accessed 2015-05-29. Copyright © 2015 Great Minds. UnboundEd is not affiliated with the copyright holder of this work. This task is notable for the way it draws coherent connections between several standards. First, it connects transformations and constructions in Part (ii), giving students a tactile understanding of transformations. Second, in part (iv), students use the properties of transformations to make a congruence statement about the two figures. Lastly, Part 2 engages students with the definitions of transformations in a novel way: they use the definitions to “reconstruct” a rotation center, reflection line, or translation vector. This task, or some variation of it, could be used to introduce the idea of congruence in terms of rigid motions, or it could be used as a way to review and reinforce that idea in the days after it’s taught. Transformations are particularly crucial in developing the conditions under which triangles are congruent, as well as the related congruence criteria (ASA, SSS, and SAS). (G-CO.B.7, G-CO.B.8) Though these criteria are sometimes treated as postulates to be accepted as true without proof, the standards ask students to understand how they follow from understanding congruence in terms of rigid motions. As an example, take this lesson, which leads students through a process of reasoning to show that, if we have two triangles with two pairs of congruent sides and a pair of congruent included angles (i.e., “SAS”), there exists a sequence of rigid motions that will map one triangle onto the other (and they are therefore congruent). In doing so, it shows how the SAS criteria is sufficient to establish congruence of the two triangles. It is true that we do not need to show the rigid motion to be able to know that there is one. We are going to show that there are criteria that refer to a few parts of the two triangles and a correspondence between them that guarantee congruency (i.e., existence of rigid motion). We start with the Side-Angle-Side (SAS) criteria. 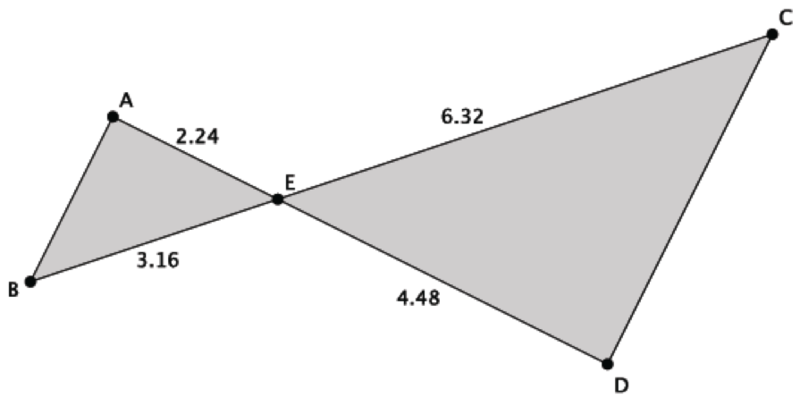 Side-Angle-Side triangle congruence criteria (SAS): Given two triangles and so that (Side), ∠ = ∠ (Angle), and (Side). Then the triangles are congruent. The steps below show the most general case for determining a congruence between two triangles that satisfy the SAS criteria. Note that not all steps are needed for every pair of triangles. For example, sometimes the triangles already share a vertex. Sometimes a reflection is needed, sometimes not. It is important to understand that we can always use some or all of the steps below to determine a congruence between the two triangles that satisfies the SAS criteria. 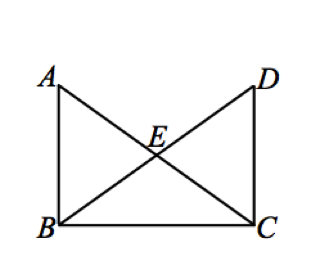 Proof: Provided the two distinct triangles below, assume (Side), ∠ = ∠ (Angle), and (Side). By our definition of congruence, we have to find a composition of rigid motions that maps to We must find a congruence so that First, use a translation to map a common vertex. Geometry, Module 1, Lesson 22 Available from engageny.org/resource/geometry-module-1-topic-d-lesson-22; accessed 2015-05-29. Copyright © 2015 Great Minds. UnboundEd is not affiliated with the copyright holder of this work. In a task like this, students bring to bear their understandings of rigid motions and congruence to construct a lengthy logical argument. For example, they look for translation that can take B to B’. This is followed by a rotation about B until AB lies on top of A’B’. Finally, a reflection over AB completes the transformations and demonstration of congruence. For struggling students, some additional scaffolding may be helpful, such as working with one side (or angle) and one transformation at a time; also, manipulatives such as transparencies can help with them visualize the transformations involved. Proofs are probably the most traditional aspect of the high school geometry standards. The two-column format still works well as a structure to introduce students to the process of formal argumentation. Although as students progress, they should see that proofs are really format-agnostic; flow-chart proofs and paragraph proofs are equally valid and sometimes more convenient than two-column proofs. There are three standards involving proofs—lines and angles (G-CO.C.9), triangles (G-CO.C.10), and parallelograms (G-CO.C.11)—each suggesting a number of propositions that students should be able to prove. Once the triangle congruence criteria are established as described above, these can be used freely in a variety of proof contexts. 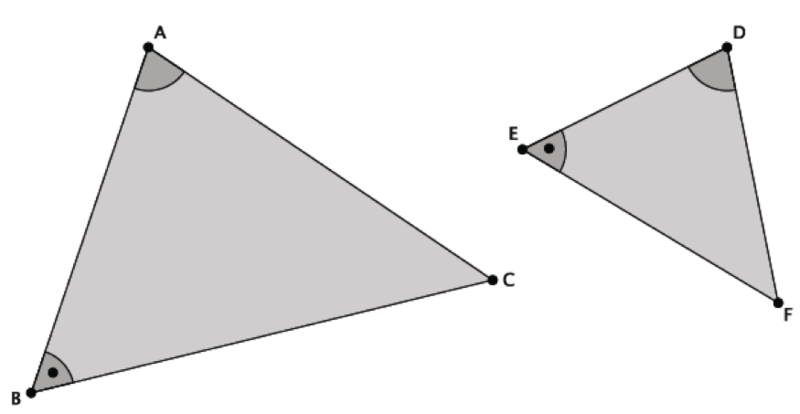 This example from EngageNY shows a two-column proof of triangle congruence using the ASA criteria. Vertical angles are equal in measure. Geometry, Module 1, Lesson 26 Available from engageny.org/resource/geometry-module-1-topic-d-lesson-26; accessed 2015-05-29. Copyright © 2015 Great Minds. UnboundEd is not affiliated with the copyright holder of this work. Note the multiple steps required in this proof, as well as the precise statements and reasons required along the way. Giving students sufficient exposure to proofs will help them to develop their skills around constructing arguments, as well as to gain fluency in applying the triangle congruence criteria. Geometry Module 1, Lesson 34 Available from engageny.org/resource/geometry-module-1-topic-g-lesson-34; accessed 2015-05-29. Copyright © 2015 Great Minds. UnboundEd is not affiliated with the copyright holder of this work. The example above demonstrates how new ideas can be proven with more traditional, axiomatic techniques, or through the properties of rigid motions. If students are seeing a task like this for the first time, consider asking them to describe what they observe about the picture, including parallelism and properties of quadrilaterals. You might also ask if they have a sense of how the top triangle can be transformed to match the bottom triangle. Some nice discussion could come from a side-by-side comparison of both methods: which one do students find easier to understand, and why? The standards don’t just include knowledge and skills; they also recognize the need for students to engage in certain important practices of mathematical thinking and communication. These “mathematical practices” have their own set of standards, which contain the same basic objectives for Grades K-12.4 You can read the full text of the Standards for Mathematical Practice here. You can read the full text of the Standards for Mathematical Practice here. You can read the full text of the Standards for Mathematical Practice here. (The idea is that students should cultivate the same habits of mind in increasingly sophisticated ways over the years.) But rather than being “just another thing” for teachers to incorporate into their classes, the practices are ways to help students arrive at the deep conceptual understandings required in each grade. The table below contains a few examples of how the practices might help students understand and work with congruence. By asking students to describe not only which transformations are at play in any given situation, but also by asking them why those transformations are appropriate, including emphasis on attribute change and retention, you can deepen students’ conceptual understanding of the connection between transformations, congruence and similarity. No surprises here, right? In order to make logical and coherent arguments with correct outcomes, students need to attend to precision in choosing and communicating the various components of their argument. For example, students attend to precision when they state that side lengths and angle sizes remain the same when a triangle is translated, so the two triangles must be congruent. Students can use tools strategically (MP.5) as they work with transformations and constructions. For example, students make use of straightedges, compasses and, potentially, geometry software to support the creation of constructions and developing a tactile understanding of the nature of transformations. This lesson contains a good example; two tools are given (compass and straightedge), but the task is fairly undirected—it’s up to the student to make decisions on how to use them. The ASA criterion for congruence requires the included side to be equal in length between the two figures. Since AA is for similarity, we would not expect the lengths to be equal in measure but more likely proportional to the scale factor. 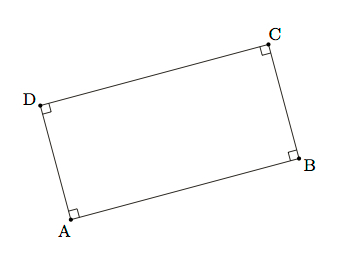 Both ASA and AA criteria require two pairs of equal angles. To do so, what scale factor should we choose? Since we dilate triangle from center by a scale factor of to produce as shown below. Geometry, Module 2, Lesson 15 Available from engageny.org/resource/geometry-module-2-topic-c-lesson-15; accessed 2015-05-29. Copyright © 2015 Great Minds. UnboundEd is not affiliated with the copyright holder of this work. This is a big moment! Instead of accepting AA as a postulate (and taken without proof), students are asked to reason through the way that similarity (in terms of dilations and the rigid motions) proves that triangles are similar if they have two pairs of congruent angles. Once the AA criterion is established, it can be used as a tool to introduce prove theorems involving similarity (which may include further similarity criteria). (G-SRT.B.4) With knowledge of triangle similarity and congruence, students can solve problems involving congruent and similar figures. (G-SRT.B.5) The example below is one such problem. Are the triangles shown below similar? Explain. If the triangles are similar, write the similarity statement. Yes, the triangles are similar. by SAS because ∠ = ∠ (vertical angles are congruent), and the sides adjacent to those angles are proportional. Geometry, Module 2, Lesson 17 Available from engageny.org/resource/geometry-module-2-topic-c-lesson-17; accessed 2015-05-29. Copyright © 2015 Great Minds. UnboundEd is not affiliated with the copyright holder of this work. A problem like this would be best given to students once they have been established based on reasoning with similarity transformations, since it requires them to use evidence and reason about similarity (rather than just finding a missing length given two similar triangles). While the sample work shown here is brief, you might have students prove or justify their ideas in any format you prefer. Much of the work in the Circles (G-C) domain also draws on the skills, understandings and types of reasoning developed in the Congruence domain. In particular, as students work with the relationships between inscribed angles, radii and chords, (G-C.A.2) and with circles inscribed in and circumscribed about triangles, (G-C.A.3) fluency with triangle congruence criteria will be very helpful. The following exercise is a good example. 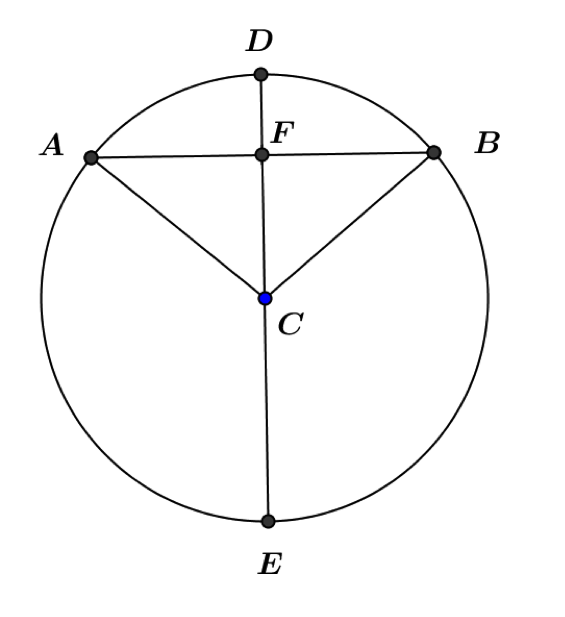 Prove the theorem: If a diameter of a circle bisects a chord, then it must be perpendicular to the chord. Draw a diagram similar to that shown below. Radii of the same circle are equal in measure. Corresponding angles of congruent triangles are equal in measure. Equal angles that form a linear pair each measure 90°. Geometry, Module 5, Lesson 2 Available from engageny.org/resource/geometry-module-5-topic-a-lesson-2; accessed 2015-05-29. Copyright © 2015 Great Minds. UnboundEd is not affiliated with the copyright holder of this work. Note how many of the ideas from the Congruence domain are called upon here: Students write a proof, they employ triangle congruence criteria (SSS), and apply a number of other important results involving angles. Lastly, the Expressing Geometric Properties with Equations (G-GPE) domain includes proving theorems using coordinates (G.GPE.B.4)—very similar to written proofs about parallelograms. (G-CO.C.11) It may help for students to see the parallels between the two styles of proof as in the example below. Draw a quadrilateral Try to draw your quadrilateral so that no two sides are congruent, no two angles are congruent, and no two sides are parallel. Suppose your quadrilateral lies in the coordinate plane. Let be the coordinates of vertex the coordinates of the coordinates of and the coordinates of Use coordinates to prove the observation you made in part (a). “Midpoint Miracle” by Illustrative Mathematics is licensed under CC BY 4.0. Take a moment to notice all that’s here that draws on prior understanding from the Congruence domain, such as work with quadrilaterals, parallel lines, and the meaning of congruent figures. The structure of the task in two parts (one without coordinates and one with) is a nice way to make the transition from congruence to new ideas in the G-GPE domain. There’s quite a bit of content packed into the high school geometry standards, but they’re intended as a capstone of the learning that occurs in Grades K-8. If your students have been following a strong, standards-aligned program for several years, you might be reaping the benefits of their experience as you read this. But high school teachers often find themselves in a challenging position, as it can be tough to ascertain what students learned in previous grades. And sometimes students have real gaps in their learning that need to be filled before high school work can begin. In this section, we’ll consider a few questions you might have as you’re planning. First, what exactly were students supposed to learn in their elementary and middle school years that supports their work with congruence in geometry? How do you leverage what they already know to make high school concepts accessible? And if some of your students are behind, how can you meet their needs without sacrificing focus on high school content? If you’re thinking that these sound very similar to some of the standards in the high school G-CO domain, you’re right. There isn’t a whole lot of difference, for example, between standards 8.G.A.2 and G-CO.A.5. But keep in mind that transformations in Grade 8 are intuitive and informal; students don’t need the same degree of precision as in high school, nor do they need to see transformations as functions. The problems below illustrate the contrast between expectations in Grade 8 and high school. 1. Let there be a reflection across line LAB. Reflect △CDE across line LAB. Label the reflected image. 2. Use the diagram above to state the measure of Reflection(∠CDE). Explain. 3. Use the diagram above to state the length of segment Reflection(CE). Explain. ➔ In this problem, which students are expected to complete using a transparency or similar tool, we see students performing a reflection and starting to generalize the properties of a reflection—namely, that it preserves the lengths of segments and angle measures. At this point, it’s sufficient for students to define a reflection in a less formal way than in high school. The two triangles in the picture below are congruent. a. Give a sequence of rotations, translations and/or reflections which take △PRQ to △ABC. b. Is it possible to show the congruence in part (a) using only translations and rotations? Explain. ➔ Part (a) of this problem begins with two congruent figures, implying that there is a sequence of rigid motions that takes one to the other. At this stage, describing a translation might involve defining a vector, or it might just mean specifying the number of units up, down, left, or right (in terms of coordinates). Part (b) of the problem asks students to apply their understanding of how transformations affect the orientation of figures in the plane. Use your compass and straightedge to apply TAB to segment P1P2 . ➔ This problem has students using construction tools to perform a translation. As they do, they’ll observe the lengths of each of the segments involved, and be able to express a precise definition of a translation: “For any point P on the line AB, TAB(P) is the point Q on AB so that PQ has the same length and the same direction as AB. For any point P not on AB , TAB(P) is the point Q so that points P, Q, A, and B form a parallelogram.” Note the use of lines and segments in this definition, as well as the use of function notation. This definition will allow students to put translations to use in proofs and problems, and to apply translations in novel problem contexts. While congruence begins in Grade 8, more fundamental concepts in geometry should be underway throughout the elementary and middle grades. As early as Kindergarten, students should begin thinking about length and classifying shapes. 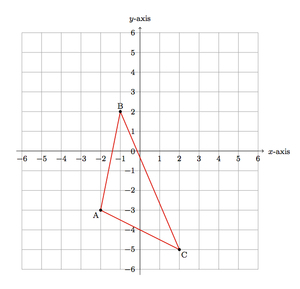 (K.G.A.2) Grade 4 turns out to be critical for success in high school geometry: The concept of angle measure is defined, (4.MD.C.5) as are points, lines, segments and rays. (4.G.A.1) In Grade 5, students learn about the coordinate plane and plot points in the first quadrant (5.G.A.1) and classify figures based on their properties. (5.G.B.3) Then, in Grade 6, students expand their knowledge of the number system to include negative numbers, thereby revealing the entire coordinate plane. (6.NS.C.8) Work on the coordinate plane continues in Grade 7, (7.RP.A.2) and students construct geometric figures to satisfy certain conditions. Based on these constructions, they make observations about triangles (such as constraints on side length). (7.G.A.2) The examples below show the types of problems students do to build conceptual understanding in each grade. Monique looked at the clock at the beginning of class and at the end of class. How many degrees did the minute hand turn from the beginning of class until the end? ➔ Problems like this help solidify the concept of an angle as a fraction of a turn. Students in Grade 4 should also learn to distinguish angle measure from length or area—the size of the clock can change, but the amount that the hands turn remains the same. True or false? If the statement is false, rewrite it to make it true. a. All trapezoids are quadrilaterals. b. All parallelograms are rhombuses. c. All squares are trapezoids. d. All rectangles are squares. e. Rectangles are always parallelograms. ➔ In this problem, we can see students classifying figures they’ll continue to use throughout middle and high school. Perhaps more significant, exercises like these reinforce ideas from Grade 4 about parallel segments, perpendicular segments and angles. Students also gain experience with reasoning within a hierarchy of concepts (so if a figure is a square, it’s also a rectangle, etc. )—a habit that will be important in later geometry. Determine all possible measurements in the following triangle and use your tools to create a copy of it. ➔ Work in Grade 7 sets the stage for high school by preparing students to use common measurement and construction tools (ruler, compass and protractor) and prompts them to explain relationships among sides and angles of triangles. If, going into a unit on transformations and congruence, you know your students don’t have a solid grasp of the ideas named above (or haven’t encountered them at all), what can you do? It’s not practical (or even desirable) to reteach everything students should have learned in Grades 4-8; there’s plenty of new material to learn in geometry, so the focus needs to be on grade-level standards. At the same time, there are strategic ways of wrapping up “unfinished learning” from prior grades within a unit on congruence. Here are a few ideas for adapting your instruction to bridge the gaps. If a significant number of students don’t have a foundational understanding of the properties of rigid motions, you could plan a lesson or two focused on performing the rigid motions with transparencies and articulating their properties before diving into high school work. (This Grade 8 lesson, which introduces translations using transparencies, might be a starting point for planning. Similar introductory lessons are available for reflections and rotations.) And if you think an entire lesson is too much but your students could still use some review, you could use two to three problems from these lessons as “warmups” to start your first few lessons on congruence. If a significant number of students don’t fully understand angles or other elementary concepts, you could likewise plan a lesson on these ideas before you begin teaching high school content. (Two Grade 4 lessons, one on angle measurement and the other on distinguishing length from angle measure, might be helpful here.) Again, if you think that an entire lesson is too much, you could plan a brief “mini-lesson,” or use some problems involving these ideas as warmups for your first few congruence lessons. Though many people know PARCC as an organization dedicated to assessment, much of its early work focused on helping educators interpret and implement the standards. Its Model Content Frameworks are a result of those efforts: They describe the mathematics that students learn at each grade level and in each high school course, and the relative amount of time and attention that standards should be given in a grade or course. Many teachers, regardless of their state’s affiliation with PARCC, have found these documents helpful. You can find them here. In this guide, major clusters and standards are denoted by a green square (e.g. G-CO.B.6). If you’re interested in seeing another high-quality geometry sequence, you might want to check out the Illustrative Mathematics Geometry course blueprint. These definitions, taken from EngageNY Geometry (module 1, lessons 13, 14, and 16), may seem very formal at first, but they illustrate the level of precision required for high school work with transformations and congruence. You can feel free to use these definitions with students (after an appropriate introduction, of course). However, these aren’t the only mathematically sound definitions out there; students might well learn others, as long as they’re later able to use those definitions to develop congruence criteria and prove congruence theorems. For a much more extensive treatment of the definitions and properties of each transformation, see pages 65-76 and 127-133 of Hung-Hsi Wu’s Teaching Geometry According to the Common Core Standards. You can read the full text of the Standards for Mathematical Practice here. Experiment with transformations in the plane Understand congruence in terms of rigid motions Prove geometric theorems Make geometric constructions Use congruence and similarity criteria for triangles to solve problems and to prove relationships in geometric figures. Identify and describe relationships among inscribed angles, radii, and chords. Use coordinates to prove simple geometric theorems algebraically. Give an informal argument for the formulas for the circumference of a circle, area of a circle, volume of a cylinder, pyramid, and cone. Understand congruence in terms of rigid motions Prove geometric theorems Experiment with transformations in the plane Make geometric constructions Experiment with transformations in the plane Know precise definitions of angle, circle, perpendicular line, parallel line, and line segment, based on the undefined notions of point, line, distance along a line, and distance around a circular arc. Represent transformations in the plane using, e.g., transparencies and geometry software; describe transformations as functions that take points in the plane as inputs and give other points as outputs. Compare transformations that preserve distance and angle to those that do not (e.g., translation versus horizontal stretch). Given a rectangle, parallelogram, trapezoid, or regular polygon, describe the rotations and reflections that carry it onto itself. Develop definitions of rotations, reflections, and translations in terms of angles, circles, perpendicular lines, parallel lines, and line segments. Given a geometric figure and a rotation, reflection, or translation, draw the transformed figure using, e.g., graph paper, tracing paper, or geometry software. Specify a sequence of transformations that will carry a given figure onto another. Understand congruence in terms of rigid motions Use geometric descriptions of rigid motions to transform figures and to predict the effect of a given rigid motion on a given figure; given two figures, use the definition of congruence in terms of rigid motions to decide if they are congruent. Use the definition of congruence in terms of rigid motions to show that two triangles are congruent if and only if corresponding pairs of sides and corresponding pairs of angles are congruent. Explain how the criteria for triangle congruence (ASA, SAS, and SSS) follow from the definition of congruence in terms of rigid motions. Prove geometric theorems Prove theorems about lines and angles. Prove theorems about triangles. Prove theorems about parallelograms. Make geometric constructions Make formal geometric constructions with a variety of tools and methods (compass and straightedge, string, reflective devices, paper folding, dynamic geometric software, etc.). Copying a segment; copying an angle; bisecting a segment; bisecting an angle; constructing perpendicular lines, including the perpendicular bisector of a line segment; and constructing a line parallel to a given line through a point not on the line. Construct an equilateral triangle, a square, and a regular hexagon inscribed in a circle. Make geometric constructions Experiment with transformations in the plane Understand congruence in terms of rigid motions Prove geometric theorems Make formal geometric constructions with a variety of tools and methods (compass and straightedge, string, reflective devices, paper folding, dynamic geometric software, etc.). Copying a segment; copying an angle; bisecting a segment; bisecting an angle; constructing perpendicular lines, including the perpendicular bisector of a line segment; and constructing a line parallel to a given line through a point not on the line. Construct an equilateral triangle, a square, and a regular hexagon inscribed in a circle. Know precise definitions of angle, circle, perpendicular line, parallel line, and line segment, based on the undefined notions of point, line, distance along a line, and distance around a circular arc. Verify experimentally the properties of rotations, reflections, and translations: Understand that a two-dimensional figure is congruent to another if the second can be obtained from the first by a sequence of rotations, reflections, and translations; given two congruent figures, describe a sequence that exhibits the congruence between them. Experiment with transformations in the plane Represent transformations in the plane using, e.g., transparencies and geometry software; describe transformations as functions that take points in the plane as inputs and give other points as outputs. Compare transformations that preserve distance and angle to those that do not (e.g., translation versus horizontal stretch). Given a geometric figure and a rotation, reflection, or translation, draw the transformed figure using, e.g., graph paper, tracing paper, or geometry software. Specify a sequence of transformations that will carry a given figure onto another. Develop definitions of rotations, reflections, and translations in terms of angles, circles, perpendicular lines, parallel lines, and line segments. Represent transformations in the plane using, e.g., transparencies and geometry software; describe transformations as functions that take points in the plane as inputs and give other points as outputs. Compare transformations that preserve distance and angle to those that do not (e.g., translation versus horizontal stretch). Given a geometric figure and a rotation, reflection, or translation, draw the transformed figure using, e.g., graph paper, tracing paper, or geometry software. Specify a sequence of transformations that will carry a given figure onto another. Represent transformations in the plane using, e.g., transparencies and geometry software; describe transformations as functions that take points in the plane as inputs and give other points as outputs. Compare transformations that preserve distance and angle to those that do not (e.g., translation versus horizontal stretch). Given a rectangle, parallelogram, trapezoid, or regular polygon, describe the rotations and reflections that carry it onto itself. Use geometric descriptions of rigid motions to transform figures and to predict the effect of a given rigid motion on a given figure; given two figures, use the definition of congruence in terms of rigid motions to decide if they are congruent. Use the definition of congruence in terms of rigid motions to show that two triangles are congruent if and only if corresponding pairs of sides and corresponding pairs of angles are congruent. Explain how the criteria for triangle congruence (ASA, SAS, and SSS) follow from the definition of congruence in terms of rigid motions. Prove theorems about lines and angles. Prove theorems about triangles. Prove theorems about parallelograms. Construct viable arguments and critique the reasoning of others. Attend to precision. Use appropriate tools strategically. Verify experimentally the properties of dilations given by a center and a scale factor: Given two figures, use the definition of similarity in terms of similarity transformations to decide if they are similar; explain using similarity transformations the meaning of similarity for triangles as the equality of all corresponding pairs of angles and the proportionality of all corresponding pairs of sides. Use the properties of similarity transformations to establish the AA criterion for two triangles to be similar. Explain how the criteria for triangle congruence (ASA, SAS, and SSS) follow from the definition of congruence in terms of rigid motions. Prove theorems about triangles. Use congruence and similarity criteria for triangles to solve problems and to prove relationships in geometric figures. Identify and describe relationships among inscribed angles, radii, and chords. Construct the inscribed and circumscribed circles of a triangle, and prove properties of angles for a quadrilateral inscribed in a circle. Use coordinates to prove simple geometric theorems algebraically. Prove theorems about parallelograms. Verify experimentally the properties of rotations, reflections, and translations: Understand that a two-dimensional figure is congruent to another if the second can be obtained from the first by a sequence of rotations, reflections, and translations; given two congruent figures, describe a sequence that exhibits the congruence between them. Describe the effect of dilations, translations, rotations, and reflections on two-dimensional figures using coordinates. Use informal arguments to establish facts about the angle sum and exterior angle of triangles, about the angles created when parallel lines are cut by a transversal, and the angle-angle criterion for similarity of triangles. Understand that a two-dimensional figure is congruent to another if the second can be obtained from the first by a sequence of rotations, reflections, and translations; given two congruent figures, describe a sequence that exhibits the congruence between them. Given a geometric figure and a rotation, reflection, or translation, draw the transformed figure using, e.g., graph paper, tracing paper, or geometry software. Specify a sequence of transformations that will carry a given figure onto another. Verify experimentally the properties of rotations, reflections, and translations: Understand that a two-dimensional figure is congruent to another if the second can be obtained from the first by a sequence of rotations, reflections, and translations; given two congruent figures, describe a sequence that exhibits the congruence between them. Develop definitions of rotations, reflections, and translations in terms of angles, circles, perpendicular lines, parallel lines, and line segments. Correctly name shapes regardless of their orientations or overall size. Recognize angles as geometric shapes that are formed wherever two rays share a common endpoint, and understand concepts of angle measurement: Draw points, lines, line segments, rays, angles (right, acute, obtuse), and perpendicular and parallel lines. Identify these in two-dimensional figures. Use a pair of perpendicular number lines, called axes, to define a coordinate system, with the intersection of the lines (the origin) arranged to coincide with the 0 on each line and a given point in the plane located by using an ordered pair of numbers, called its coordinates. Understand that the first number indicates how far to travel from the origin in the direction of one axis, and the second number indicates how far to travel in the direction of the second axis, with the convention that the names of the two axes and the coordinates correspond (e.g., x-axis and x-coordinate, y-axis and y-coordinate). Understand that attributes belonging to a category of two-dimensional figures also belong to all subcategories of that category. Solve real-world and mathematical problems by graphing points in all four quadrants of the coordinate plane. Include use of coordinates and absolute value to find distances between points with the same first coordinate or the same second coordinate. Recognize and represent proportional relationships between quantities. Draw (freehand, with ruler and protractor, and with technology) geometric shapes with given conditions. Focus on constructing triangles from three measures of angles or sides, noticing when the conditions determine a unique triangle, more than one triangle, or no triangle. Use geometric descriptions of rigid motions to transform figures and to predict the effect of a given rigid motion on a given figure; given two figures, use the definition of congruence in terms of rigid motions to decide if they are congruent.